Well, you may have noticed a precipitous drop in the number of posts over the past few days, but I assure you I have a good reason. At the beginning of the month I accepted a position with Prince William County’s Historic Preservation Division. I am the Historic Site Manager for both Ben Lomond Historic Site (an 1830’s house that served as a field hospital after First Manassas) and Bristoe Station Battlefield HeritagePark. As you know, we only have around 50 days until the 150th anniversary of the Battle of Bristoe Station, so I will be doing everything from helping to install an exhibit at the Manassas Museum that opens next weekend to installing interpretive signs at the battlefield park and getting the site ready for the large crowds we are expecting. One piece of “insider information” I can offer you now is that Brad Gottfried’s new The Maps of the Bristoe Station and Mine Run Campaigns will be available at the commemorative weekend and Brad will be there to sign copies! Listed below are all of the events, tours, and activities that the great staff at Prince William has put together. 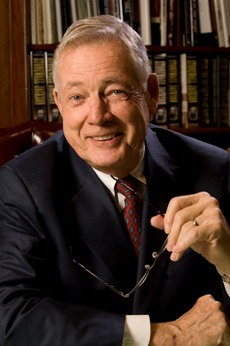 And for those of you who might be on the fence, I have two words for you: Bud Robertson. Enjoy a full day with an in-depth tour of the sites and battlefields that made up the Bristoe Campaign. Stops will include: Bristoe Station Battlefield Heritage Park, Auburn, Remington and Buckland. Historians will explain how this important campaign impacted soldiers, civilians and its overall impact on the outcome of the Civil War. Participants will have a chance to see little known or visited sites. Contact Bristoe Station Battlefield Heritage Park at 703-366-3049 for more information and reservations. 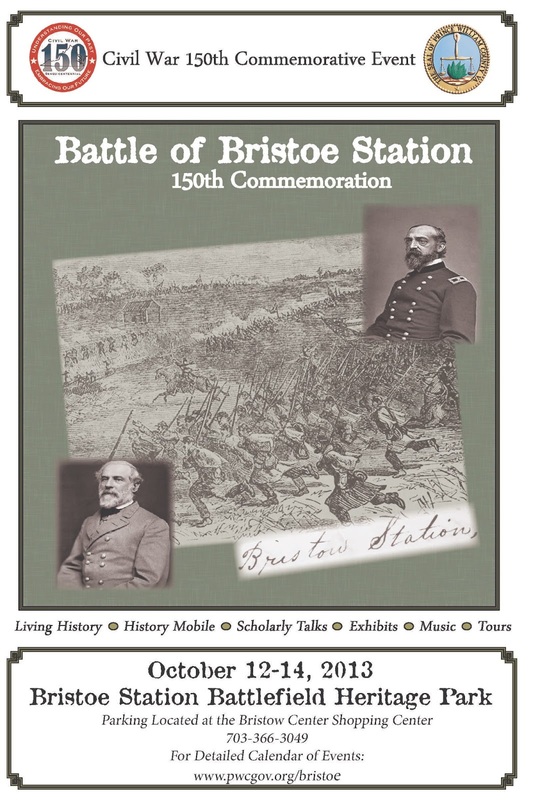 To commemorate the 150th Anniversary of the Battle of Bristoe Station, tours, musical performances, lectures, tours and living history demonstrations and encampments to represent the soldiers and units present at the battle in 1863. Weekend kicks off on Saturday at 10am with a dedication ceremony featuring keynote speaker Dr. James I. Robertson Jr. The Virginia History Mobile will be available on Saturday and a Youth Activity Tent will also be available all weekend. Battlefield Tours ongoing on the hour from the program tent (11am-4pm). Living history demonstrations on going in camp areas (see map). Virginia History Mobile 11am-4pm. Battlefield Tours ongoing on the hour from the program tent (11am-3pm). Living history demonstrations on going in camp areas. Today I came across an essay that deals with a question that has plagued Civil War battlefields and museums for decades – how do you attract African Americans to your sites and events? Having been in the field of public history since 1998, I have heard frustration over a lack of African American participation and enthusiasm voiced over and over again…and no matter how hard sites try to bend over backwards to attract and accommodate a black audience, results never seem to match expectation. Well, today on a blog operated by the Atlanta Journal Constitution,Natasha McPherson of Spelman College chimed in on this dilemma. I would posit that these two quotes from her larger explanation of why African Americans are unconcerned with the Civil War actually raise more questions than they answer. - Is she giving credence to the Black Confederate myth when she declares that blacks “fought and died on both sides of the conflict”? - What body of evidence is there that would imply that the Civil War didn't really abolish slavery? This leads to the issue I allude to in the title of this post – is there any wonder that blacks would be indifferent when the war is framed within this negative and pessimistic context? The implication is that there is nothing that blacks can take away from the Civil War experience that they can be proud of – it was all too horrible, so why go back and retread such awful and painful ground? 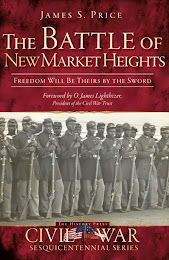 McPherson obviously brings an entirely different set of experiences to her observations and that is fine – I just can’t help but feel different based on my experiences speaking to African American groups and attending living history events with the 23rd United States Colored Troops. In my experience, the question I hear repeated over and over again within these communities is – why didn’t anybody tell me about this? At a recent event with the 23rd, I had the pleasure of talking to an African American couple who had driven many miles just to see and talk to the members of the 23rd because they had no idea what USCTs were or how large their participation in the war actually was. They were completely intrigued. When I was done talking to them, they were literally giddy with what they had just learned and couldn’t wait to go home, buy some books, and learn even more. And this was not an isolated incident. 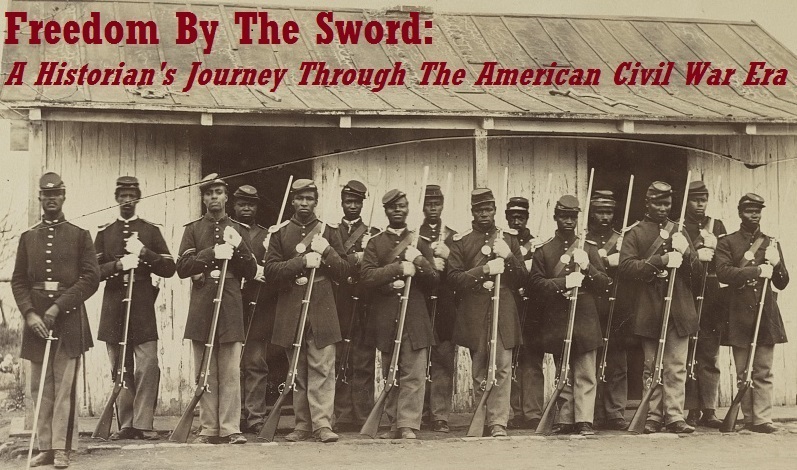 Many African Americans I have spoken to feel a sense of loss that they have gone their whole lives without hearing about black participation in the Civil War. Sadly, McPherson’s perspective would seem to leave little room for such edification.